The ABS control unit monitors whether the wheels are locked or not by comparing signals from the speed sensors attached to each wheel. When the ABS control unit detects a locked wheel, it sends a signal to the ABS actuator, which consists of a solenoid valve, pump, pump motor, and brake-liquid tank, to open the valve. Opening the valve causes an instant decrease in the caliper fluid pressure and weakens the braking force. This causes the wheel speed to recover, following which the unit rapidly raises the caliper fluid pressure again via the ABS actuator to increase the braking force. In other words, the ABS prevents the brake from locking up by increasing and decreasing the caliper fluid pressure. To increase the caliper fluid pressure, fluid is pumped back into the master cylinder. This makes the pump motor operate rapidly. A normal ABS operation cannot be obtained if the battery voltage fluctuation resulting from this rapid motor action affects the PWM current signal, which controls the solenoid valve. Thus, there is a need to observe the effect of this battery voltage fluctuation. The 2GPoint (Max.) long memory enables all of the behavior from the start to end of braking to be captured at a high sampling speed. It is also possible to measure the abnormal portion of a period in detail using the zoom function, while grasping the entire behavior. Automatically sets the area for automatic measurement of waveform parameters, so as to match the zoom area. The zoom function not only enables detailed observation of the abnormal portion of a period, but also enables automatic measurement of waveform parameters within the zoom area. The above figure shows the measured data obtained in an operation test of the ABS control unit. 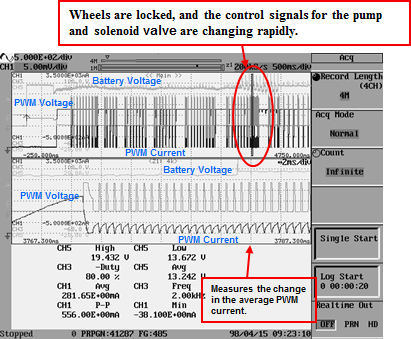 We made the wheels lock up, and measured the influence of battery voltage fluctuations on the PWM current signal.